The ingredient Ogre's Teeth is primarily collected from dead Ogres. As part of the quest Drunk and Disorderly, Margarte states that she is interested in buying Ogre's Teeth and Minotaur Horns. She will buy them in bundles of 5 for 100 gold a bundle. If the Fighter's Stronghold official plug-in has been installed, it is possible to give Melisi Daren a set of Ogre's Teeth and she will create a stuffed replica of an Ogre. It can also be found randomly in the inventories of alchemy vendors (starting at level 20) and in some Monster loot chests (starting at level 16). Ogre's Teeth can be collected from all varieties of dead ogres, including standard Ogres, Savage Ogres, Pale Pass Ogres, and Redguard Valley Ogres. 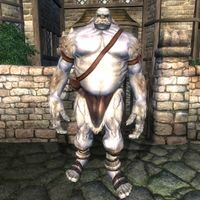 Standard Ogres are most frequently encountered as randomly generated Monsters. In Monster Dungeons (circles on map), they will be found starting at level 18; boss-level monsters are guaranteed to be ogres at levels 16 and 17. 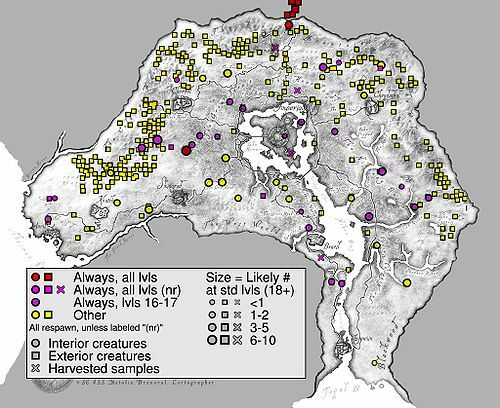 Outdoors (squares on map), they are found in Hills, Highlands, Mountains, and Snowy Mountains regions. In the wilderness they appear starting at level 18; along roads, they appear starting at level 16. 17 Pale Pass Ogres appear in Pale Pass, which becomes accessible during the Lifting the Vale quest. 7 Redguard Valley Ogres appear in Redguard Valley Cave. There is an additional Redguard Valley Ogre Chieftan who only appears during the Sins of the Father quest and does not respawn. 7 Savage Ogres appear in Sedor during the quest The Stone of St. Alessia. 6 Ogres appear in Bleak Mine during Malacath's Daedric Quest (although killing any of them will make you fail the quest). 3 Savage Ogres appear in Nonwyll Cavern. 1 Ogre is found northwest of Faregyl Inn; he is part of the quest The Potato Snatcher but is present even if you have not started the quest. 1-2 Ogres will be your opponents in the Arena Grand Champion matches at levels 15-17. This page was last modified on 18 October 2018, at 06:01.